Winter can be smothering at times, choking out our days with blankets of snow—or worse, smog. Utah’s winter weather could be why this month’s Gallery Stroll offerings lean toward escapism. Whether it’s finding comfort in similarities, exploring dreamlike lands, or partying like it’s Fat Tuesday, the Salt Lake Gallery Stroll has the cure for all those winter hues. Utah Arts Alliance presents the second annual Curiouser and Curiouser exhibit at the Urban Arts Gallery. Local artists explore the imaginative and wondrous world of Lewis Carroll’s beloved classics Alice in Wonderland and Through the Looking Glass. A Mad Artists reception party will be held Friday, Feb. 19 from 6 p.m. to 9 p.m. in conjunction with the public Gallery Stroll. Patrons will enjoy a Mad Hatter–style tea party. Costumes are not mandatory—however, best-dressed will be awarded prizes. Enjoy the various interpretations of this timely tale while sipping on tea and cookies, all the while enjoying the vibrant ambience of DJs and live music. Everyone is welcome. The Urban Arts Gallery is located at 137 South Rio Grande St. at The Gateway. For those who want a quieter gallery experience, the show opens Feb. 2, and will be on display through Thursday, Feb. 28. For more info, visit urbanartsgallery.com. Relating to someone else is an effective way to escape one’s own tedious reality. It’s the basis for reality television’s popularity, and one reason why people look to connect to the world through various media art forms. It’s a fundamental part of our being to connect ideas, share experiences and relate to the people around us. On Feb. 19, Alpine Art and Frame open the exhibit Relatable, a clever show focused on artists who are related—not by blood, but by their style, approach, medium, subject matter, color or composition. We know that art has a way of speaking to the viewer, but what message will it convey when it sings in a chorus of related work? Alpine Art is located at 430 E. South Temple, and the opening reception is Friday, Feb. 19, from 6 to 9 p.m.
Ready to get out of Dodge but can’t afford a Vegas vacation or a trip to promenade Bourbon Street? 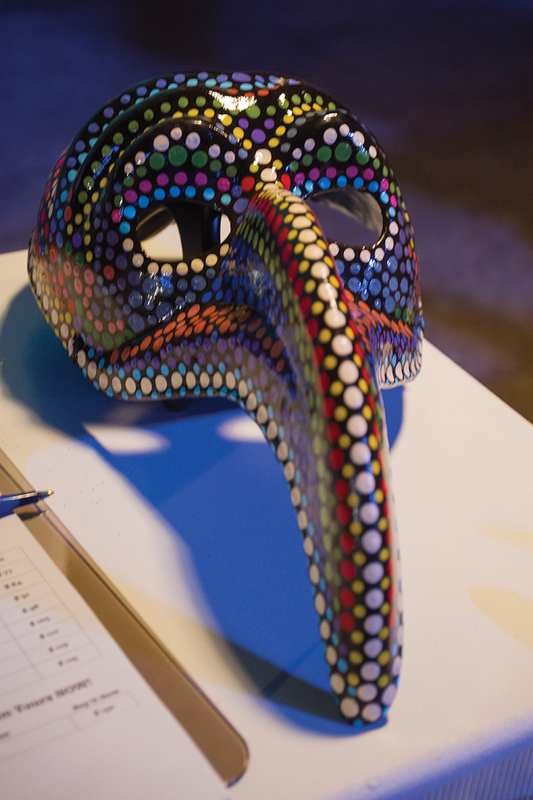 Try a mini getaway to the Falls Event Center on Feb. 20 for the Utah Arts Festival’s annual Masquerade Party, benefiting the 40th annual Utah Arts Festival. Enjoy food, drinks, dancing and “just for fun” gaming (it’s still Utah, kids—no gambling here). Tickets can be purchased at uaf.org. Now, if you only had something to wear—fear not: The mask exhibit on display through Feb. 12 at the Utah Arts Festival Gallery on 230 S. 500 W. can provide you with lots of wardrobe inspiration. 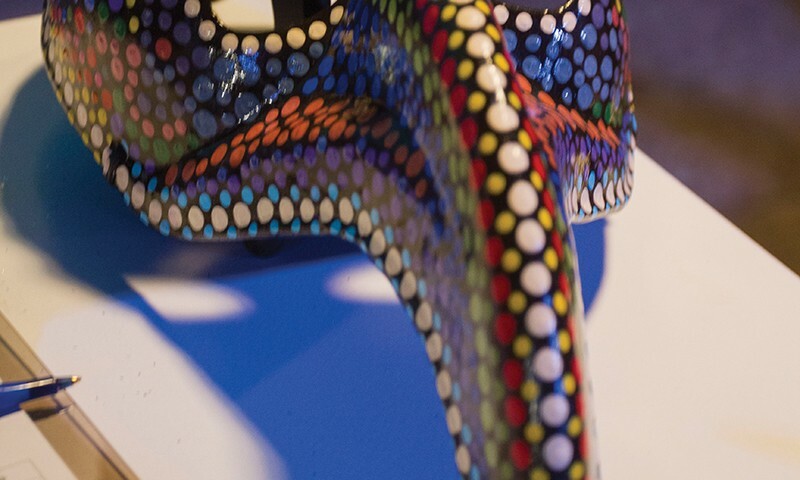 Twenty-six of Utah’s hottest artists created one-of-a-kind mask creations, all of which are available for purchase and can be picked up prior to the big party for your stylish escape. When the pressure of winter seems like too much and you need a change in scenery, don’t head for the hills—go out for a Gallery Stroll.